Maybe if you whistle a tune it will soothe him. Yeah... Try that. This card needs a cost bump for those stats. Awesome card. 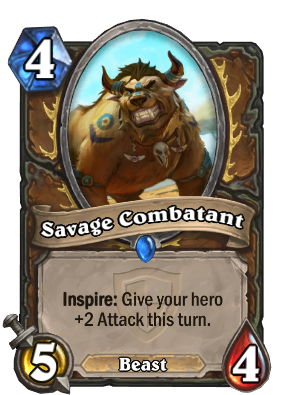 The damage it gives to your hero power allows you to take out little minions and weaken the big ones to make better trades which is something highly apreciated for a class with poor removal and no comeback mechanics. Also the damage is great to get close to lethal range. The sad thing is that if ANYONE else had this card on their deck it would be a must use. Yeah, let's say that after Priest gets Shifting Shade and Priest of the feast, and not when I posted it at first ages ago. Artwork and gameplay of this card is just awesome. very cool card, may spawn the rise of the face / agro druid. That or Innervate + Coin on turn one if you're going second - More likely, and damn scary! As you can Turn 2, smack for 8 if you use your Hero Power! I am really loving this card. I didn't think it would be that good but it has a big body and the inspire really helps you clear stuff out. Plus in the beast druid deck I am running it fits perfectly into the mana curve providing a big body on turn 4 or help for clearing on 6. This card is not OP by any means but it is strong enough to where I am really excited about it. I am a huge fan. ...Yeah be careful innervating into this guy. Piloted Sky Golem finally getting a well-deserved buff... oh wait, Dreadsteed exists. Awkward. This card is relatively intimidating, because your foe will die quickly by taking 8 damage per turn if this card survived. It attacks into the Sludge Belcher and survives while the 1/2 slime would be killed by the 3-attack hero. But it's still too easy to remove and of no use against aggro. Nice inspire effect.Nice way of using class card mechanic to avoid it being power creep.